Do you need help problem-solving and strategizing? Is it time to increase your intuition? Are you misunderstood and underestimated? 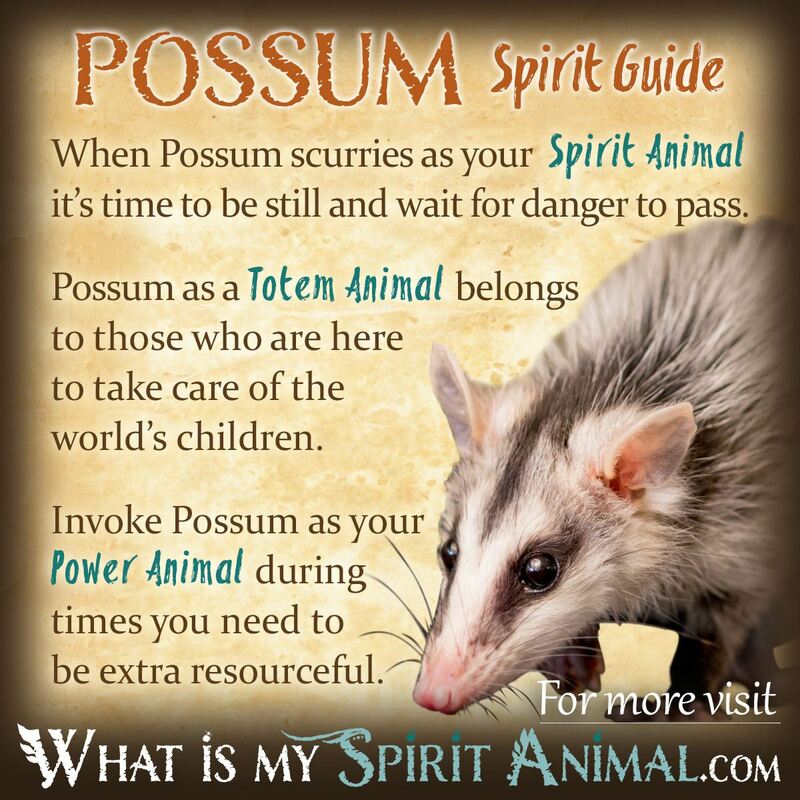 Possum as a Spirit, Totem, and Power Animal can help! Possum teaches how to find fast fixes to complicated problems and how to renew and resurrect yourself! Delve deeply in Possum symbolism and meaning to find out how this animal spirit guide can support, assist, and inspire you. Possum vs Opossum – the only difference between a Possum and Opossum is spelling. Most folks have heard the old adage “playing Possum”. This term refers to the Possum’s behavior of “playing dead” as a strategy to ward off would-be predators. But this term is extremely misleading. Possums (Opossums) do not choose to ‘play’ dead. When scared, these sweet, gentle peace-loving creatures have an automatic ‘shut off switch’ in their nervous system. During times when the fear gets to be too much, they lapse into a coma-like state. Because of this, Possum or Opossum symbolism and meaning is that of a master trickster and problem-solver. When he/she is not “playing Possum” this creature endeavors to come up with an alternative plan for difficult situations that doesn’t require fighting. Based on this, one potential symbolic meaning for Possum (Opossum) is having effective strategies, and projecting the image you want people to see. In nature the Possum cannot see at birth. This forces the young animal to go on instinct and really hone their senses for survival. So while the Possum spirit may not appear very impressive initially, He is an excellent guide for developing your own senses and uncovering elusive truths, including spiritual ones. The Possum’s habitat is typically a burrow, an opening in a tree, and under piles of leaves and brush. In more urban settings they may surprise an unsuspecting homeowner by skittering out from a shed, garage, gazebo or deck fixture. They are nocturnal so these locations provide darkness for sleeping. This environment provides Possum Spirit with strong Earth Elemental ties and Tree vibrations that you can tap into for various ceremony and magical workings. Possums (Opossums) are, sadly, short lived creatures. Nonetheless they often come to help their young because of their vulnerability, and this Spirit Animal likewise protects those young in spirit embarking on a soulful quest. For such tiny creatures who have many natural predators, the Possum Spirit has a highly social and curious mind that seems to know when to run, when to hide, and when to move forward. When Possum shows up, ask yourself if you’re taking the right road for your goals or if you’ve wandered off track. If the latter, Possum may just say, “lie still and play dead”. Use that time to think of alternatives and truly assess the hidden matters of your circumstances. Don’t forget using surprise or distraction as Possum-supported aids. Possum’s mantra: read between the lines. When Possum (Opossum) arrives as your Spirit Animal, be ready for some changes. You may hear opportunity knocking or have the chance for adventurous travel. However, Possum’s message is one of caution. Not all is as it seems. Some options would leave you over exposed and vulnerable, while others would take you away from cherished goals. Possums always look for the path of least resistance. If Possum has presented as your Spirit Animal, it might be time to take a hard look at the persons and situations in your life. What or who is really worth fighting for? Is it time to walk away – to keep your mind, body, and spirit safe? Possum (Opossum) as an animal spirit guide offers to help you tap your senses deeply so you make the right decision, one that really pays off holistically. In the process you may well discover some skills and aptitudes you never knew you had reawakening, often from past lives. Another reason Possum may be speaking to you is so that you cultivate your inner child. Possum (Opossum) are marsupials and the pouch nourishes the young. If you are young in spirit, or have lost touch with the simple outlooks of children, hop in that pouch and let the Possum offer you protection while you meditate on whatever seems missing. Ultimately Possum is a survivor and with Him at your side as a Spirit Animal, you will likewise survive whatever threatens to overtake you including fears or emotional trauma. Put your house in order then move cautiously forward. People born with a Possum (Opossum) Totem Animal know how to blend into society and their environments with easy. That means you’re not overly accessible until you trust in people, places and situations fully. This distance from various circumstances affords you important time to think and plan patiently as to how to best manifest your goals. Possum people have keen intellects who depend on their minds over muscle. While other people spend their energy in the fight, you wait until the right moment to make your move. This means that you can become very successful if you listen to the guidance of Possum by staying grounded, realistic and biding your time. Momma Possums (Opossum) do all they can for their children. A mom will carry 15 or more babies on her back. If Possum (Opossum) is your Totem Animal, you likely are involved with the care and welfare of children – whether your own, in your local community, or around the globe. Often I’m asked how an animal that essentially faints when it’s scared could ever be a Power Animal. Well, it is precisely because the Possum ‘dies’ and comes back to life that they make such powerful, well, Power Animals. Call on Possum energy and medicine when you need to ‘come back to life’ – especially after an overwhelming time. Seek out Possum (Opossum) as your Power Animal when you can’t seem to wrap your head around a good solution to perplexing problems. Possum is a bit unorthodox and secretive, so He keeps you out of the forefront to work behind the scenes. Possum is also a good animal ally for multitasking and adapting to various life roles while staying true to your sacred self. A Possum Power Animal combines the best of two worlds: resourcefulness and pragmatism. What face do you need to show the world today? Can you remain true to your own gentle, passive nature in a harsh world? Are you backed into a corner? Sometimes Possums have to bare their teeth and hiss. Finally, Possums (Opossums) are underestimated and maligned because of their appearance. Much like the burly, tattooed biker who many assume is mean-spirited but who cries at Hallmark commercials, call on Possum energy when you want to be seen for who you truly are. While Native American stories don’t talk much about Possum, those that do feature him portray a trickster or clown who plays dead to get out of danger. Among Mexican tribes women carried Possum tails as a charm for safe birth. Like many other trickster spirits, some folk tales say Possum brought fire to humankind. Some Native American Warriors looked to Possum as a teacher and a role model. When they were in mortal danger from an enemy, like this Spirit Animal, they would play dead until the opponent was close enough to strike. Combined with a rousing war cry, the shock effect alone was sure to put them at the advantage. Possum (Opossum) appearing in your dreams is often a sign that you are over-exposed in a situation. You either need to put on your camouflage or get out. There’s something you are not seeing and its important. Do not be deceived, even by yourself. Learn more about Rabbit Spirit by reading What Do Rabbit Dreams Mean? on WhatIsMySpiritAnimal.com! Australian Astrology tells us that January is the month of the Possum. If you were born in January you’re a determined, hands-on individualist with keen instincts. You take your time and exercise patience in planning, often on a large scale, making you perfect for business efforts. Possum people are great leaders, being both adaptable and flexible. You always have a proverbial plan “b” and even “c” when plan A goes awry. All this thinking makes for a rather serious personality that proves enigmatic even to your loved ones. For your relationships to work out long term you must be intellectually matched with your mate and base your communications in honesty and candor. Hi, I really love opossums and I’ve been seeing them around a lot lately, but not in dreams. I have severe depression (three time suicide survivor) and anxiety, I just recently got out of a toxic relationship and I dread the upcoming school year because so much has happened and I don’t know if I can handle that kind of stress. How, if the opossum is my spirit animal, will it help me through these things? Has it already helped me so far? Find whats natural in your life, remove yourself from material things and simplify your life, even friends etc connect to Earth and help Earth. Listen and be the beautiful person you are. You are here for a reason so am i. Be true be loving be giving be connected to nature. Selena we will definitely be keeping you in prayer for all of your struggles. I found this while looking up possible spiritual meanings behind the possum because I just recently joined an online school for spirituality a spiritual growth and have had a possum start sneaking into my house and watching me while I work on m studies. I found this page on a whim but it seems oddly fitting. Why do I see possum every where. I hit a possum last night, in the middle of the highway going 60 mph, after closing an important business deal. I’ve never hit an animal before, and it was a random and strange experience. Any interpretations of this? I saw a possum tonite which at first looked to me like a cat. It walked along the edge of my building but didn’t back away so I took a small detour; when it saw I was no danger it kept going on its way. I watched it and observed it going in around circles and following a scent or something but followed this pattern at least 4-5 times in a row. it did this on one side of my building, went to my side of the condos and then off into the bushes. Any insight to if this means something for me personally? i like animals but have never had this happen to me before, and lived here for over 20 years. I dream a lot. So how do I determine that possum is my spirit animal when I have a dream of 2 albino possums in my bed right after having a dream of a mama bear dragging her baby across from a lion? Odd dream but i dream them. What does it all mean? Possums do have some sort of sensitive to danger or mishap. I have noticed a possum family underneath in the crawl space of my next door neighbors home. After they were removed by professionals there was a break in the street in front of the house that denoted their was a problem with the sewer. That was over 3 yrs ago. Recently 9 months ago in July, the new neighbor that moved into the home (does not speak English so he said) was standing in front of my window in my garden apartment. It frightened me as it was about dusk. I called the police and told them he was just standing there looking in. They went over and said, as I told them, he had moved to the next window crawched down taking a picture with his phone. The police said he took pictures of the possum that was nestled in the leaves in front of the window. He said he was from California and never seen a possum. After two weeks of that incident he was looking down in front of my home in the street and saw a break in the cement. Now, since the break is in the sewer line of my home. I must pay big money to have it repaired. The work is still pending as I cannot find the truth of the problem. I feel these possums are of the spirit. It is frightening to me and worries my everyday for the solution. Eventually it will be revealed, I don’t know how at this writing. I don’t trust this neighbor as he seems as mysterious as the opposum and I don’t trust him. The police told him to stay off my property because he was trespassing. There is no fence between my home and where he lives and rents. I am now invaded my ants. If these are signs that I must move on then I fear for my lifef as I have no where to go or the means to get there. .